On Saturday 18 February 2017, as part of Glasgow Film Festival, the eighteen students enrolled in the Film Exhibition and Curation Masters at the University of Edinburgh presented “MOVE: A pop-up audio visual experience”. The event was part of coursework in their Applied Learning module. But it was not mere homework – it was an ambitious and inventive evening, taking more risks than any of the other pop-up screenings in the ‘Special Events’ strand. Instead of starting from a well-known feature film title and arranging the space and ancillary events around its plot and theme, the curators here started with a concept (move!) and experimented with its expression in and around film. Or rather – they dealt with the realities of putting on a show, collectively, over the holidays, on a tight budget, and with a big change of plans halfway through. As a learning experience, this is invaluable. I have had the pleasure to read some of the reflections produced by the students, which are nuanced and thoughtful and full of rich connections between the curatorial and film theory and their concrete project. I had a chance to chat with about half of the group after their final lecture. They asked me to give collective rather than individual attribution to their remarks, and I have also paraphrased for clarity. One of the attractions of the event was its setting. Joytown is a new venue in a very old building. It is not, however, one of those obvious pieces of Victorian Heritage; it is, and has always been, an unassuming warehousey block where the attraction is inside. 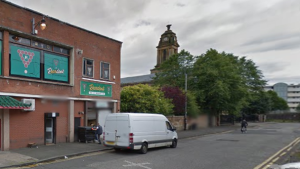 It is located on the North-Eastern edge of Glasgow’s city centre, a corner of the city that was badly mangled by the construction of the Glasgow Inner Ring Road in 1971. In the late 19th century, the Cowcaddens area had been notorious for its slum housing as well as its abundance of cheap music halls, theatres, and circuses. The building opened in the 1890s as part of the vast Olympia Hall, leased and transformed over the years by various entertainers who put on Wild West shows, pantomime, and variety. Most famously, it became the Scottish Zoo and Variety Circus in 1897, when legendary showman E. H. Bostock not only brought in exotic animals, but also the latest novelty – moving images. After the First World War, the building was put to various unglamorous uses, and languished for a while. In the 1990s, that corner of Cowcaddens was re-developed as ‘Chinatown’, with the opening of shops and restaurants to serve the Chinese community. The ground floor of the building now houses the Chinatown restaurant, a large cash-and-carry business and a seafood merchant. On the first floor, until last year, was Reardon’s Snooker centre. This is the part that is now being re-invented as Joytown, one of its old names. At the moment, however, it is a very austere space, to say the least. The night before the screening there had been a clubnight at the venue so the curators had their work cut out. “We carried a lot of tables”… “we cleaned a lot on our hands and knees”… “Oh, the broken hoover!” The tables were set up cabaret-style. The decorations committee “used their own craft skills to make paintings, to make table decorations”: On each table there was a little battery-operated tealight and a bottle with the flag of an European country painted on it. There was also a programme with the film information and a postcard – a random, vintage postcard, on which the audience was invited to write their thoughts. The amount of collective effort put into the encounter with the audience was visible, and each element seemed to carry a different nuance of the overall sense of the event. Having been used in various combinations of variety theatre, menagerie/zoo, fairground, cinema, skating rink and ballroom, that distant past of pictures and dancing is most appealing for a new life with, well, pictures and dancing. I knew about this history before coming to the event, and my experience was tinted by a yearning to find a connection to that past, to see a spark from their carbon arc projector shining through the century. 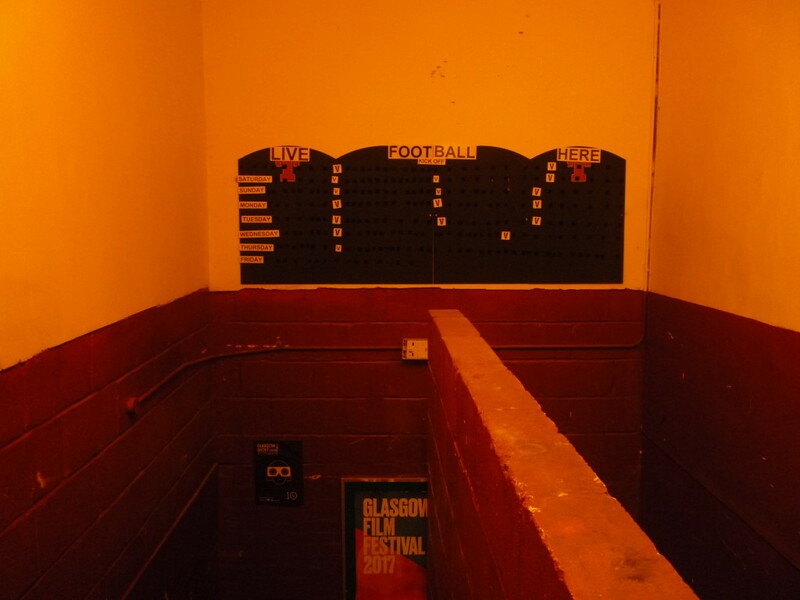 For the less informed visitor, however, only the more recent history of the building is visible – emblazoned in its snooker livery and football score boards. It was up to the curators to tell a story about the space, as one of the various stories being told. When the students first visited the venue, owner Paul introduced them to the history of the building. While he knows about the older entertainment venue part of the story, he has been more keen to emphasise the Chinatown location. This was however seen to be somewhat incongruous with the film programme’s European focus. “He had this idea of putting up Chinese decorations. There were a few elements here and there but we didn’t want this to be at the heart of the exhibition because it would clash with our programme.” Furthermore, the notion of Chinatown did not seem to be particularly compelling for Glasgow residents, as the area is very small and does not have the same significance as in other parts of the world. This difference in ideas did not get in the way of other aspects of the collaboration with the venue. The owner was on hand to arrange supply of drinks, staff the bar, sort out electrics and tech set-up, and book a DJ for the after-party. When the planned caterers fell through, he also offered “the local knowledge of where we could get the food”. This collaboration was acknowledged with gratitude, and it was also not one-way only. Apart from all the cleaning and tidying, the curators feel like their event has had a lasting impact on the venue. One of those decisions that may have left an imprint on the configuration of the venue was the decision to curtain off a section at the back of the venue as a separate screening room. Here, a different programme of films was shown, including a mash-up of scenes of movement and travel from various movies. A few beach chairs offered a change of posture. A smoke machine was used in this space, drawing inspiration from the steam that billows around the first film of the programme, the Lumière Brothers’ Arrival of A Train to La Ciotat (1896). That ‘train steam’ had the double effect of making the projector beam visible, and evoking the smoke-filled atmosphere of an old cinema. If it wasn’t for the beach chairs this would be like a little nickelodeon, even if it was intended more like a black-box gallery projection room. I saw the same kind of partition used a few weeks later, when Glasgow Short Film Festival used Joytown as a ‘VR Palace’. This shows how MOVE!’s resourceful solution to make the vast open-plan space more interesting was noted and adopted, potentially informing future uses of the venue. The film component of the evening included ten short films in two sections. The order of the films was carefully planned for variety and balance, with each section featuring some animation, some dance, and some archive material. The programme was shaped equally by concept and necessity. Budget and time set boundaries as to what films could be included. “We were sourcing quite close to the event […] Especially the short films, it was about what we could get and then making it fit into the whole programme”. The challenge produced an inventive, surprising programme, enriched by live music, dance, and words. 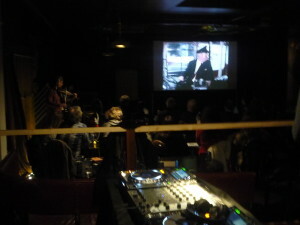 Two abstract films by Margaret Tait, chosen with advice from Tait expert Dr Sarah Neely, filled the room with colour and joyful music. This found a contemporary echo in the playful Latvian short Choir Tour (Edmunds Jansons, 2012), a crowd favourite. Two very different traditions of experimental film shifted the tone: First was Lithuania’s Ecce Homo (Vidmantas Baciulis, 1972), a once-supressed record of a theatre avant-garde with earnest liberatory politics; then, Enrico Cocozza’s Masquerade (1953) represented that bizarre mid-century moment when Scottish amateur cinema was equal parts bourgeois parlour game and Freudian adventure. Orgesticulanismus (Mathieu Labaye, 2008) was an incredible animation that re-imagined the joy of movement from the perspective of someone who has lost their physical mobility. Another animation and a dance video completed the two sets. At the heart of each half, however, was a 15 minute compilation of archive footage from the National Library of Scotland’s Moving Image Archive. The students had edited this, showcasing the new kinds of skills that the role of a moving image curator may entail in the era of Audiovisualcy. The band Sink accompanied the archive films with their delicate extemporising on accordion, violin and soprano saxophone. Their involvement came about through their previous work with producer Shona Thomson, who is a guest tutor on the MSc and mentored the students through the project. Shona has extensive experience producing live cinema events, especially working with archive film and live music. Last year she produced a Scotland-wide tour of the 1926 animated film The Adventures of Prince Achmed, with live accompaniment by Sink. 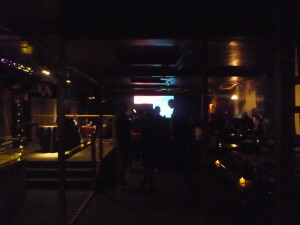 For the last film, two dancers performed in front of their screen, only their silhouettes visible against the bright colours. This spatial arrangement was unrehearsed, and the curators recognised that “the dancers were difficult to see [but] because where the projector was, the dancers went over the screen a bit, it was a nice relationship between the dancers and the films being screened.” While I could indeed barely see them from where I was sitting, their presence somehow grounded the evening’s theme with the corporeality of their movement: Liveness made tangible as a shadow on the screen. I was moved by the emergence of something new in that unrehearsed intersection between film, music, and bodies in movement. Another aspect of cinema liveness that is easily taken for granted is the spoken word that precedes the films. Here the research and argument that underpin the programme are offered to the audience. The two presenters were confident and professional (though they say it is their first time), neither pompous nor patronising. Taking the introductions as a serious part of the programme, rather than a throwaway couple of lines, sets a good example for all film exhibitors. The Lithuanian film, which was perhaps the most challenging for the audience, was contextualised with an informative, poetic and passionate introduction, and the voice-over was translated live. This not only added to the sense of discovering a gem that we would have not found otherwise (brought back from the vaults of a national film archive), but also shows that the lack of subtitles is not a good enough reason not to screen something. This image of the transient audience metamorphosed into an idea of a somewhat mobile audience. Rather than being set up in rows, seating was around tables, and the offer of a free drink and availability of a couple of food options were intended to encourage people to move around the space. The fragmented nature of the programme also provided more ‘exit points’ for anyone wanting a change of scene, and this was reassuring for the programmers, as it took some pressure off the main selection: “Because we were not so confident that our main screen would attract so much attention, that people might get distracted, we wanted to have other things on the side”. However, people had other ideas: “The main programme was really successful, people were captivated by the main exhibition.” Hence, that mobile audience didn’t really materialise on the night. The lights were kept on during the archive films, while the band played. When the lights went down, however, it was interesting to observe how people interpreted this a command to be quiet and watch the film. In other aspects, however, audience response was closer to that envisioned. People ‘got’ the theme and enjoyed making connections between the films. The breadth of the topic created space for thinking, and there was an invitation to share those thoughts on assorted vintage postcards which allowed for a more personal, less tick-box approach to feedback. “Because this venue is not a traditional theatrical screening venue, I feel like the people are happy to sit there to receive something that is new […] If we had screened the whole programme in a traditional theatre, it wouldn’t have worked, the effect wouldn’t have been as good. The mix of live music, the bar – it is a new experience. People were taking pictures of the space, as well […] as somewhere they hadn’t been before, that was really exciting, and then running these different films to them in this completely new space”. Towards the end of our conversation, the group tell me that their tutor, Susan Kemp, described the event as ‘a happening’, and they have come to identify with that label. In its situated activation of a curated programme, its one-night-only alchemy, MOVE was perhaps more purposeful than a traditional ‘happening’. However, it embraced the openness of the moment, it allowed meaning to emerge in the gaps between things. MOVE was full of experimentation and discovery, it challenged its creators as much as it rewarded its audiences, and it’s difficult to imagine a more successful learning experience for these emerging curators. Post-script: The first published version of this post implied that only a mash-up loop was shown in the partitioned space, and therefore missed the connection to the Lumière film. I am grateful to Noemi who contacted me with additional information and corrected this imprecision. Thank you to the students who shared their time and reflections with me: Noemi Lemoine Blanchard, Camilla Baier, Rachel Pronger, Lennard Kroeger-Petersen, Guangyun Liu, Katy Wale, James McLaren, Paulina Drėgvaitė, Federico D’Accinni, Richard Tanner, Amy Lea. Thank you to Susan Kemp and Jane Sillars, directors of the MSc. This entry was posted in Screenings and tagged archive film, cinematising the space, curation, live music, liveness, pop-up, programming, spaces. Bookmark the permalink.